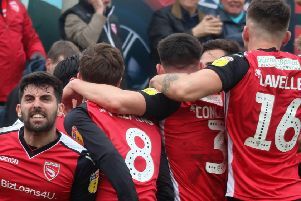 It was the first time the Shrimps had won three straight league games at the Globe Arena - and the first time at home since 2010. The main talking point, however, was manager Jim Bentley’s decision to recall skipper Barry Roche in goal for his first appearance since being injured in October. Mark Halstead had played all 26 games since then but was dropped to the bench after conceding four goals at Swindon Town the week before. Here, Bentley discusses the club’s goalkeeping situation going into tomorrow’s match at Macclesfield Town.